"Working together to control and/or contain the spread of noxious and invasive plants in the Lower Platte River drainage." 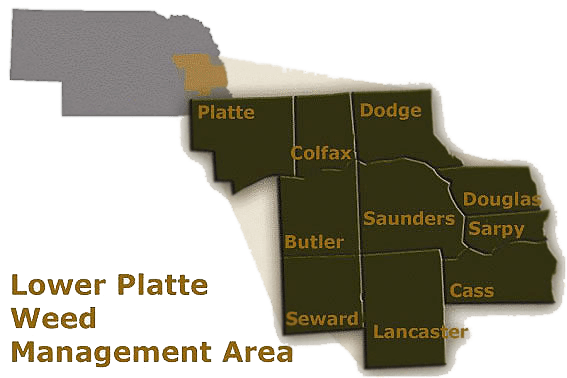 Welcome to the Lower Platte Weed Management Area's Website! The Lower Platte Weed Management Area was organized in 2002 to assist landowners along the Platte River, from Columbus to the Missouri River, in dealing with newly invading plants in riparian areas. Eradicating populations and preventing establishment of purple loosestrife, saltcedar and phragmites. Implementing a survey and monitoring program to target the control efforts and track the accomplishment of these objectives. Promoting organized efforts to control these invading plants in upstream. These objectives have been broadened by having an overall goal - To improve the health of the riparian areas of the Lower Platte River for the benefit the owners, users and general public by controlling and preventing all riparian plant invaders and improving stream flow capacity by managing the vegetation in the stream bed and on the banks. Learn more about our efforts in the About Us section.